Another highly successful Pentlands Book Festival draws to a close after hosting two weeks of events in Colinton, Currie and Juniper Green. Since I love books and I love cooking (not to mention eating it) ‘Cooking the Book’ with Ruth Shannon (Colinton Library, Thursday 2pm) was a must-see. Former owner of Ruth’s Kitchen in Juniper Green, Ruth Shannon is a cordon bleu chef now in post at Hawthornden Castle, the international retreat for writers. Ruth has a long culinary history, from baking scones in her Great Aunt Alison’s kitchen in North Berwick to working throughout the UK and internationally. Ruth is also an author, and learning about the ‘how’ of writing – and photographing – a cookery book is fascinating. 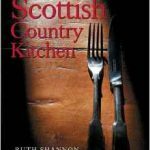 Ruth’s Scottish Country Kitchen, is a lovely, full colour production, of recipes that are easy to follow without compromising on taste or sophistication. I said I love cooking, but I’m often daunted by recipes that need a page of ingredients, and always include one or two teaspoons of things not found in the local supermarket. Not so Ruth’s book. Other highlights of the Pentlands Festival included: Kathleen Jamie, winner of the 2016 Saltire Society Book of the Year, and Chris Brookmyre talking about his crime novel of the year. There was also Alan Bisset’s performance of ‘The Moira Monologues’, Catherine Czerkawska, and Margaret Bennett speaking about Walter Scott.